Auroralight Announces New LSL10 Luminaires – Auroralight Inc.
(CARLSBAD, CA – September, 2018) Auroralight, manufacturer of the world’s finest solid copper and brass landscape lighting solutions is pleased to introduce the new LSL10 Agave directional luminaires. This revolutionary little spotlight packs some serious punch! The new LSL10 micro directional luminaire is a high performance, low energy LED accent light. Machined from solid brass bar, its artistic styling and precise machining make this fixture both attractive and functional. 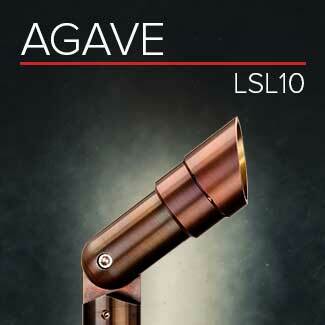 The LSL10 Agave may look small, but it is extremely powerful! Paired with our exclusive AMS™ mounting system, there are a plethora of mounting possibilities. TRIAC Dimming to <10% typ.